Just for the young farmers or farming enthusiasts. 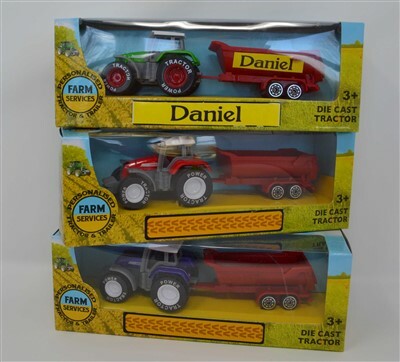 Our fab 1:64 scale tractor and trailers are available with either red, blue or green tractors. The trailer is personalised on both sides and the box is also personalised with the same detail. What a super keepsake of their special day. Not a toy, keepsake only until age 3.